We believe volunteering is important, but we often wonder if you think so too. So let us know what you think. Why do you think it’s important? With our Coastal Clean Up effort this past Saturday GET REAL Involved! has topped 2000 hours of service. We are thankful to all the students and adults who have been there to help us grow, and particularly HYDE PARK UNITED METHODIST who has been our benefactor and biggest supporter. Wow! What an incredible morning we just had. Well that is after we ran back in to grab out jackets before heading to the beach… haha. 26 Heroes (most from a group for students called ‘GET REAL Involved!’) came out to the public beach on Courtney Campbell Causeway (Clearwater side) to spiff up a mile and a half stretch of beach over-looking the Tampa Bay. At first glance these kids were thinking, there’s no trash here, but as I drew their eyes down to the sand, they realized that some times ‘trash’ comes in the smallest forms. The top invaders of this beach were cigarette butts and bottle caps. Volunteers spread out in all directions, then falling behind each other like waves, catching the small stuff missed by those ahead. It took two passes to get everything up. Much of the bigger and heavier stuff was found in the sand grasses stretching out beyond the parking allowance towards Bayside Bridge. We wrapped it up just a little after 11:00am and with October finally feeling like October, it seemed we reached our goal without even breaking sweat. Our 2009 Final coastal cleanup event tallied up with a whopping 30 bags, 1 lg pipe section, 1 sheet of plywood, 1 rusted steel barrel and 1 spoke wheel with an average total weight scale of 1530lbs. Our cigarette butts came to an estimated count of 3250, bottle caps were 1427, 1230 cigar tips and 500 feet of monofilament line. Also keep an eye out in the next couple of weeks when we announcement our 2010 Make Mine Bluegreen Calendars available for purchase and where to find them. 100% of the proceeds will be to help us reach more places more often in 2010. We brought 17 students and four adults with us to clean up the beach, and as Princess says, while at first we thought we were not going to find much, our students quickly learned that there were yucky treasures hidden on that beach. The students were crawling through the mangroves, digging up buried trash in the sand, and attacking that coastline with enthusiasm. After the clean up was done for the morning, Princess took the time to talk with the students about what they found and the impact society’s carelessness with their trash has on the environment. So it was a service learning project at the end of the day! Thumbs up for Bayshore Pointe! It was a busy summer for the GET REAL Involved! crew. We visited with residents of Bayshore Pointe Nursing Home in June, cleaned up Gandy Beach after a busy July 4th weekend, and spent the morning helping out at Metropolitan Ministries in August. We also said a little “Thank You” to Hyde Park United Methodist for all their support by helping to landscape their grounds. There are great photos on our Facebook Fan Page. In all we had 42 students and 7 adults who contributed over 200 hours of service this summer! It was the capper to a great year for GET REAL Involved! At the beginning of the last school year we had a goal to get even more involved. To date GET REAL Involved! has served over 1,800 man hours in the community, over half of it in the past year alone. We launched a dedicated website at www.getrealinvolved.org, formed a Facebook Fan Page, started this blog, and got involved with the Twitter craze! It was a busy and productive year. And we look forward to 2009-10 with equal enthusiasm. We are making even more inroads with Hillsborough County Schools to raise awareness of GET REAL Involved! and the opportunity we present for students throughout the county to earn their service hours and GET REAL Involved! in their community. We hope to see even more new faces this coming year through the additional exposure within schools. In 2009-10 we will answer Dr. Martin Luther King’s call to service on his birthday in January by returning to Steppin’ Stone Farm. 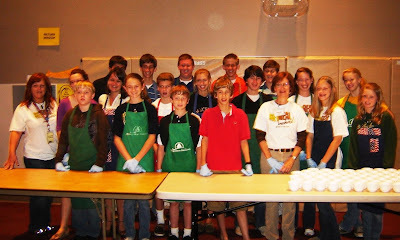 We will also once again take part in Global Youth Service Day April 2010. Other trips on the agenda include another Coastal Clean Up, Open Arms Ministry and of course, Metropolitan Ministries. The full schedule is located on the website. Coming up next is our quarterly trip to Steppin’ Stone Farm. This is one of our more popular trips (perhaps its the lunch they serve us!!! ), or more likely getting to hang out with the great gals from the Farm. Whatever it is, the trip fills up fast, so be sure to reserve your spot! Here’s to the beginning of a new school year, and engaging even more students in community service. 2009-10 will be the year to GET REAL Involved! We headed back to Lithia, FL to visit the girls at Steppin’ Stone Farm for the second time this year. In total there were fourteen of us, nine students and five adults for this trip. On the bus trip out everyone was excited because Steppin’ Stone Farm is one of our favorite sites. We try to get out once a quarter and over time have come to know the girls and develop some relationships. Matt, one of our students from Madison, has a particular fondness for this place and all the girls remember him and greet him with smiles and special cheers. Of course, they were glad to see all of us, and we were all greeted enthusiastically, mostly because of the job they had in store for us! We have spent most of our trips helping out with the cash crops in their green house. The girls took their ornamental grasses to the Strawberry Festival to sell for funds to support scholarships. We all have a sense of ownership over the crops because of all the work we’ve helped with and expected to begin readying the crops for next year’s festival. But this trip was a little different. We were met with several HUGE piles of mulch and the assignment to spread the mulch to cover the roads within the complex. The mulch was dumped courtesy of the power company who was trimming and mulching trees among the rural roads of Lithia. A HUGE pile of mulch greeted us as we arrived. It was a hot May day, sun was shining brightly and we set to work immediately. Because we visit so often, we sort of know the ropes. The staff at Steppin’ Stone Farm had lined up all of our tools, including a long row of wheelbarrows to haul, haul, haul!! We separated into two groups right away, and headed to two of the four piles of mulch. Manned with pitch forks, rakes and shovels we began to tackle our respective piles with gusto! Several students, and Dave our bus driver and big man extraordinaire began pitch forking mulch into the wheelbarrows, which were wheeled to the appointed spreaders in both groups who raked the mulch onto the row. It took us about an hour to take the mulch pile down and spread it on the road. A bunch of girlsl came to help us about 45 minutes into it and the work went even faster. The second group moved onto the second pile as the first started to dwindle down and had a good head start once the groups joined together. The work was hard, and the sun was hot, but all hands continued to work through like absolute pros! Fortunately the staff had brought out water to keep us all hydrated, and we took breaks in shifts so that the work progressed fairly continually. By the time we had finished with the last pile our white GET REAL Involved! shirts were considerably less white! Everyone was pretty beat, but we all felt satisfied by the progress we had made. Katie & Grace pause to pose! After the mulch was spread we headed off for our favorite part of our trips to Steppin’ Stone Farm: LUNCH! Lunch time is a great time to spend time with the girls. We all sit at eight-top tables, members of the GET REAL Involved! crew intermingled with the girls from the Farm and we catch up and have great conversations. We are all so amazed by these girls who are going through a tough time in their life, but who express such hope and determination. And the food is always so good. This trip the meal was something called “Cheese Burger Casserole” and all we had to say was YUM-MY! Several of the girls are “graduating” the Farm this month. Some will actually graduate High School after completing their studies on the Farm and others have progressed far enough that they are leaving the Farm “recommended” and will go home and integrate back into the “real world.” This is an exciting and scary times for these girls, but as we listened to one soon-to-be graduate talking about how she is going to pursue her engineering degree we knew that the Farm has prepared the girls who are leaving to enter life with a renewed outlook! We heard from some of the other girls who are staying how they are planning to make specific progress to insure they are ready to re-enter the world as well. Their determination and drive is inspiring because its clear that they are relying on skills and confidence they learned on the Farm to make plans for a brighter future. On the bus ride back we talked about our day and how spending time with these inspiring girls and all the hard work made us feel. The one thing that came through loud and clear was that the mulching assignment was a big hit. The students felt that the assignment, because it had a beginning, middle and end, made them feel like they really accomplished something. And that because the girls would have had to spend probably the next few weeks getting the job done in between studies and chores, that we really made a difference in their lives by being there. Thoughts of the experience of being on the Farm for the residents was another thing that stood out for the students. They thought about the fact that these girls were on the Farm because someone cared enough to intervene and send them to a place where they could re-group and get a new start. But they also talked about the fact that while it’s exciting that these girls have the opportunity to start over they appreciated the fact that these girls were obviously “stepping up” to do the work required to achieve their new goals. The final thought that the GET REAL Involved! students learned from the girls on the Farm was that when faced with a problem, sometimes it’s best to separate yourself from that problem to give yourself a chance to learn how best to deal with it. A good lesson for us all! If you’d like to see more photos from this Steppin’ Stone Farm project, visit our Facebook Fan Page. And feel free to leave a comment below! Next trip is a Thursday trip now that school is out. We’re heading to Bayshore Pointe Nursing Home on Gandy Boulevard. If you’d like to register for the trip, click here. This summer we have organized trips on three Thursdays. Each of them will also provide the opportunity to spend the second half of the day doing something fun with our host Hyde Park United Methodist Youth Ministry. On the 11th they will be heading to bowling at Pinorama. The April project took us to America’s Second Harvest of Tampa Bay, the areas leading food bank, and a member of Feeding America network. America’s Second Harvest of Tampa Bay services 10 counties in west central Florida. Since they began operation in 1982, they have processed and distributed 100 million pounds of safe and nutritious surplus food to those who need it most. Through the combined efforts with over 350 partner charities and churches, America’s Second Harvest of Tampa Bay currently distributes enough food in a single week to provide over 100,000 meals! With the current economic conditions, more people than ever are in need of food banks. Demand is up as much at 35% in some areas of the country. The good news is that giving is up as well, and so our students were put to work as soon as they arrived at America’s Second Harvest of Tampa Bay sorting all of the latest donations. We were lucky to join up with another group from Hands on Tampa (HOT) who were also answering the call to help end hunger in the Tampa Bay area. We brough nine students and three adult volunteers who set to work organizing a pleasantly large amount of foods that needed to be sorted into manageable lots of food for ease of shopping by area agencies. Jessica, Scott, Andrew, Robbie, George, Fadi, Eric, Matt and Damian were eager volunteers. And no one stopped moving from the moment we arrived. As whenever we work at America’s Second Harvest, we began the day by watching a video on the does and don’ts of sorting food. It’s amazing the amount of food stuff that would otherwise go to waste if it weren’t for the efforts of area food banks. We had two new volunteers this month, Eric and Matt, who didn’t miss a beat in getting the hang of how we GET REAL Involved! They are students at H.B. Plant High School and are working on gaining their service hours for the Bright Futures Scholarship award. Damien, who joins us from Madison Middle School, is now an old pro, having been with us for the last two projects. Scott, while it may appear by the photos of him that he was goofing off, was really a great asset to have on this trip, keeping us all fairly organized! Fadi, and Dave our adult volunteer provided most of the muscle for the heavy lifting. Andrew and Robbie provided comic relief. And all the guys seemed to LOVE throwing things into the industrial size trash cans! Nothing like getting to break things on purpose! (Jessica just rolled her eyes!!). By far the greatest number of items to be sorted was salad dressing. We were all hungry for a salad before long. We also had some interesting food stuff from Europe, and we all wondered how the heck it got to Tampa, FL! And we also wondered what clotted cream was! We worked for a couple of hours, then had a mandatory break, and then got right back to it. All in all it was a great day. Everyone seemed to have a good time, while knowing they were making a difference. We asked the students as we headed back from project what struck them as the most significant thing they learned. The answer: who knew there were so many salad dressings! To see photos of this project visit our Facebook Fan Page. Local student service organization’s members to serve on April 25, 2009, at America’s Second Harvest of Tampa Bay. In recognition of Global Youth Service Day (GYSD), on Saturday, April 25, South Tampa- based student service organization GET REAL Involved! will join over three million youth worldwide by volunteering at America’s Second Harvest where they will assist in sorting surplus food to be distributed among Hillsborough County’s needy. In addition to being a major initiative of the Obama Administration, in Hillsborough County as in other Florida counties community service is a key criterion for eligibility for Bright Futures Scholarships as well as for entrance to select honors programs and scholastic organizations. Through its monthly turnkey community service trips in support of area agencies such as America’s Second Harvest, Metropolitan Ministries and others, GET REAL Involved! 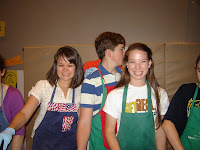 assists area teens in meeting their volunteer hour requirements among friends and peers via planned, organized, and chaperoned volunteer events. Moreover, GET REAL Involved! provides an environment independent of parents where students are free to develop their own value system relative to community service. Sponsored by the Youth Ministry of Hyde Park United Methodist Church, since its inception GET REAL Involved! has logged a total of 1,200 local service hours. All trips are fully chaperoned by background checked adults, and all sites are screened to insure accommodation of student groups. For GET REAL Involved!’s Saturday, April 25th Global Youth Service Day event, students will meet at 7:30 a.m. at Hyde Park United Methodist’s Magnolia Building. From there, they will be transported as a group to America’s Second Harvest for a four hour shift. Following the shift, students will be transported back to HPUMC’s Magnolia Building for pick up by parents. Participation in the event is open to all area middle and high school students upon completion of the required parental permission forms, obtainable upon arrival for the event. This March we returned to Open Arms at Hyde Park United Methodist. The program has really grown and now tops out at about 200 guests each Sunday morning. Students of GET REAL Involved! 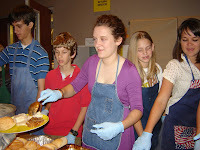 were on hand to prepare bread and fruit for the guests, and to serve each with a smile and kind words. There w as a ton to eat: biscuits and gravy, sausage, eggs, barbecue…it was a nice meal on this sunny Sunday morning. It actually was a little less sunny early in the morning because the clocks “sprung ahead” one hour in the middle of the night. But despite the earlier than usual hour, eighteen students were on hand to do their part. And while at first, as one would expect, eyes were a bit blurry, by serving time, all the students were wide awake, laughing with their friends, and with the guests. Damian, Christine and her little brother tackled preparation of the bagels with cream cheese. Cort and Andrew were on the fruit cup preparation and despite some misguided instructions from Catherine, they had the line ready to go by serving time. Then of course we all had to wait out “the lull.” (The lull time is that in between time when all the food is ready to go, but we wait on all the guests to arrive, get their seats, and stock up on coffee and juice.) Just before serving begins Hyde Park United Methodist’s Joyful Praise Ensemble comes in to sing for the guests. 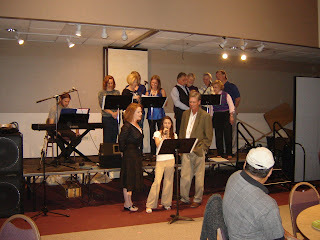 They performed about three songs, then it was time to give thanks and the meal began. Meg, Marge, Hayden, Scott, Damian, Jessica, Madelaine, Fletcher, Lindsay, Carly and Cort took the first shift on the line, greeting each guest as they came for food. Hayden, Andrew and Tyler took the role of “runners” to bring food as the line ran low. 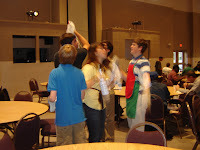 The second shift of servers included Jessica, Tyler, Andrew, Robbie and Dan. Tanner, brother Brooks and sidekick Nina (who are all old pros at serving at Open Arms) helped to keep the flow going. Things start moving really fast once serving starts. Matt B. was the front man on getting the process of cleaning the dishes going. He had staked out that position early and worked with the Open Arms team to be sure the process would run smoothly. As dishes were emptied, both inside the kitchen and out in the dining area, the GET REAL Involved! team operated like a smooth running machine. Meg and Robbie helped Lee get all the plates dried and put away. And while some continued to man the line, clean up of the 20+ tables began. Wiping them down, collecting all the chairs, and breaking down the tables. It’s quite an operation. The cool thing is that many of the guests pitch in. Because of daylight savings time, some guests arrived an hour later than normal, so we split into two teams: one to continue serving and the other split between cleaning up the kitchen and the dining room. Tyler manned the “Zamboni” style vacuum cleaner – and of course Tanner had to get his turn at that too, so they traded off. Nina, Hayden, Dan and several others, kept the process going until everything was back in its place. The line was broken down, the kitchen floors swept, and all the guests had departed. It was like the melee of activity that is Open Arms had never taken place! One of the best things about GET REAL Involved! is that we can have so much fun while we work to change the world! It may seem like a simple morning serving 200 homeless men and women isn’t really changing the world, but we think every act of kindness helps to change the world. Our next project will be on April 25th at America’s Second Harvest. If you’re interested in finding out more, click here. Talk to you next month! Tagged as "community service", "Open Arms", "volunteer"